Have you ever done something good, but for the wrong reasons? I think we can all recall a time in our lives where we have wanted to do something noble (and perhaps have even done it) but our reasons for executing it have been less-than-admirable. What and where is the line in that situation — if you do something for the greater good, but end up causing harm or doing it selfishly, does that negate the thing you did in the first place? This moral tangent is brought to you by this week's episode titled "Vigilante." It's kind of funny to me that as Arrow begins to wrap up its flashbacks this year, it's giving us subtle flashbacks in Star(ling) City. You see, in this week's episode, Oliver is treated to a vigilante — you know, the kind he used to be. Okay, maybe that's a tad bit extreme because Oliver certainly never viewed human beings as collateral damage in his vengeful season one crusades. But the point kind of still stands that Oliver — someone who has changed his methods and evolved since the beginning of his crusades — is forced to look the person he used to be square in the eye and stop him. It makes me wonder, though, what is actually going through Oliver's head. If he had been presented with a mentor-like figure at the beginning of the series who also donned a mask and stopped bad guys (but did it the right way), would he have been receptive? Why should he expect Ski Mask Vigilante to be any different? (For the record, that's what I'm calling him and I have zero regrets. We might use SMV for short from here on out in the review.) 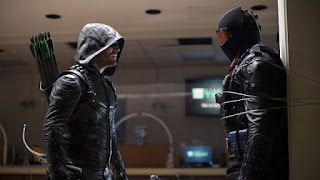 While Team Arrow deals with the newest vigilante in town, which involves a case/minor bad guy I didn't care about, elsewhere in the episode, Thea deals with Quentin and Diggle deals with his new normal. Before we begin, let me preface this review by saying that I'm not angry at Arrow for anything they're currently doing. In my opinion, season five is the unwanted consequence of their screw-ups in season four. They're trying to get their story train — which derailed horribly thanks to one Baby Mama drama story and the focus it sucked away from everyone else and everything else — back on track. But if you've ever tried to reset something, it's not always as smooth and easy as you might hope. Most of season five so far has just been filler: tying up loose ends that the writers forgot about, or were lax about, last year. Their issue now is that we've spent five years with these characters already. A reset at this point (much like in Community, when showrunner Dan Harmon was fired after the third season and new producers were brought in for the season that followed — trust me, I have Community references for DAYS) doesn't feel natural and it's pretty jarring. We don't want to watch Oliver and Felicity start over with new love interests because we still remember how great they were together. We don't want new team members because we remember how effortlessly Team Arrow used to click. So I get it, readers: I get that you're frustrated with this new direction Arrow is taking. But my argument would be that it's not a new direction as much as it's a slow-motion charge to the station we started at. Essentially, the train fell off the tracks part-way through our journey, but it's always been going in a circle anyway. We've always been headed to the same place. And though I can see, way in the distance, that station where things return to the show I once really cared about, that doesn't mean the journey isn't frustrating. I'll be the first to admit that I've felt super ambivalent about the series this year, and have kind of lost my zeal for Olicity. That doesn't mean it won't return — maybe it will — but it simply means that I can't keep watching the show, waiting for it to jump back in time to the place right before Oliver lied about his reason for sneaking over to Central City. I think that's what a lot of people (the ones I hear at least) want: they want to return to a timeline in which Oliver and Felicity are happy again. But we can't do that. We can't fly toward a station that's not ready for us because that's how trains are destroyed. And that's how stories are destroyed, too. So while I don't like Annoying Reporter Chick any more than you do (I think it's because the actress who plays Susan plays her with such a haughtiness and desperation that immediately makes me cringe) and Billy Malone is just kind of existing at this point, I'm willing to wait and see what Arrow will do to Oliver and Felicity through these relationships. Because if the relationship is pointless (hello, Mr. Ray Palmer or Oliver's relationship with that flashback chick), I'll be the first to call the writers out on it. But I'm going to wait and see what they choose to do. The problem that I have with SMV and his story with Oliver is that it's a pretty generic, cut-and-dry, classic Arrow story: Oliver tries to save the city his way, but his way doesn't seem to be getting results. Taking down bad guys is SMV's goal, but he doesn't seem to have a moral code he abides by. You'd think that the code would go something like: "Kill the bad guys but make sure the innocent people are safe." But this is the small thing that sets SMV apart from who Oliver used to be. Even when he was killing people left and right (as the team reminded him last week), Oliver tried his best to keep people who were innocent out of harm's way. SMV is more concerned with ridding the city of bad guys — like an exterminator, ridding your apartment of bugs — than he is the safety of those who aren't bad. Extending the metaphor a bit, it would be like your exterminator being excited that he removed the bugs from your house, and also barely disappointed that he killed your pet bird in the process of spraying chemicals. That's the difference between who Oliver used to be and who this new vigilante is. SMV is so myopic that he's willing to do whatever it takes to get the bad guys. Oliver, on the other hand, realizes that while getting the bad guys is a priority, there's still some sort of code of vigilante ethics that people should adhere to. SMV doesn't want a code; he wants to take every bad guy down, one by one. And so when the team confronts him, SMV tells Oliver that if he isn't with this crusade, then he's against him. Oliver stands his ground (despite his hesitance over the success of his own vigilantism) and turns his back on SMV. Like I said, SMV is a character who is so stereotypical of this show, but just different enough to warrant an episode focusing on him. I don't get it either. Quentin resigns from his position in Oliver's mayoral office because he's never stopped being an alcoholic and hasn't gotten help. His self-deprecation is only worsened when he thinks about how disappointed Laurel would be in him. It's Thea Queen, true mayor of Star(ling) City to the rescue! Can I just pause a moment to discuss how brilliant Thea's arc has been over the past few years? She mentions it briefly to Quentin in their goodbye scene, but it's extremely impressive to me that Thea went from a total party girl to a nightclub owner, turned vigilante to a self-possessed, composed woman in government. I didn't much care for Thea in the beginning of the series because she was an archetype. But now? Now she's anything but an archetype. The biggest character flaw Thea has — and always will have — is her desire to fix people and get them to be who she thinks they should be. It's the stubbornness and relentlessness that drives Thea to do this, but I think she finally realized in this episode that she can't fix everyone. She can give advice and she can push people toward the direction they should go, but she can't force them to become better. They have to want it. After years of torment and self-doubt and trauma, Thea has finally embraced the light, totally and completely. While Thea operates in the light, she tries to pull Quentin out of the darkness. I think that's her problem throughout most of their arc, honestly: she tries to tug Quentin in a direction he can't force himself to go. You can't pull someone out of the darkness who sees darkness as home. So what Thea does in "Vigilante" is what we should all do when we see someone in pain. She sits in the darkness with him. Thea doesn't try to fix Quentin anymore. She doesn't try to direct him to the light, where he should be. Instead, she confesses her own pain and Quentin opens up about his grief. She tells him how she's changed, and he tells her that her mother would be proud of the woman she became. Thea tells him that Laurel would be proud of him for taking the right step forward. So Quentin enters rehab, with Thea supporting him. These two characters have such an interesting dynamic — like a pseudo-father and daughter thing, and considering how Oliver and Laurel dated for a long time, I expect that Thea spent a good deal of time around Quentin (maybe, I'm just spitballing here) — which I appreciate. I like that Thea learned to stop playing therapist and stop asking Quentin about his drinking. I like that she learned that to help someone in pain, you have to sit in their pain with them long enough to understand WHY they're feeling the way they are. Only after you've absorbed some of their pain can you begin to walk toward a recovery and a solution together. I like the little brief glimpse we got this week into how Diggle is feeling about essentially being on the run forever. He confesses to Rene and Curtis that he's going to miss his son's birthday party because government surveillance is waiting for him to come home so they can throw him back into prison. Diggle is forever on the run and it's weighing on his emotions pretty heavily. Luckily for Diggle, Rene actually listened and found a way to help — he calls Lyla and she and the baby (I guess he's a toddler now, technically) surprise Diggle. The three have a little birthday party and it's pretty cute that Rene decided to do something nice for Diggle, especially since the two aren't especially close. Finally, this episode didn't really deal with Prometheus (except for Quentin freaking out and thinking that the creepy dude is setting him up)... until the very end of the episode, in which Evelyn is on the rooftop, turns around, jovially confronts Prometheus and then tells him that no one suspects anything from her. I'm not gonna lie, I love Evelyn. I keep referring to her as Baby Canary, and I like that now she might be dark (or at least, definitely, a double agent). I'm a sucker for female villains and antiheroes, you guys. I really am. Again, this week's episode of Arrow was just okay. It was, as I described it on Twitter, a middle-of-the-road episode in a middle-of-the-road season. Hopefully the pace will pick up and plotlines will begin to fall together in the future. In the interim, however, it looks like we just need to sit back on the train and enjoy the slow ride. "Who gets to decide who's a psycho and who's a vigilante?" I honestly don't know what's happening in the Bratva flashbacks. Someone comment below and catch me up to speed. I'm watching them but I'm definitely not processing them. Oliver kind of told the team off for being okay with SMV killing bad guys but not him killing bad people in the past. It was the first time all season I think I've been on Oliver's side during a conversation. It was weird. I'll never stop loving the really insane, intense score for whenever Prometheus is on screen. All the kudos to Blake Neely. "Try us. We're empathetic! ... Well, one of us." "I'm not here for you." "THEN STOP TRYING TO KILL US!" Oh, right, Oliver and Susan go on a date in this episode. She's creepy and tells the security guys Oliver has to text her whenever he leaves the office so she can not-so-casually run into him on his way out. That's the point in which she really bugged me. Also bugging me? Her desperation. Dude, if you have to try THIS hard to get a guy to go have a drink with you, maybe he's just not that into you. Haven't you ever seen that movie, Susan? It's great. You should rent it. ASAP. Oliver had this cool bulletproof-net arrow this week. I'm still so excited at the possibility that Evelyn is evil. SHE'S A TEENAGER. AND MAYBE A VILLAIN. AND AN UNSUSPECTING ONE. 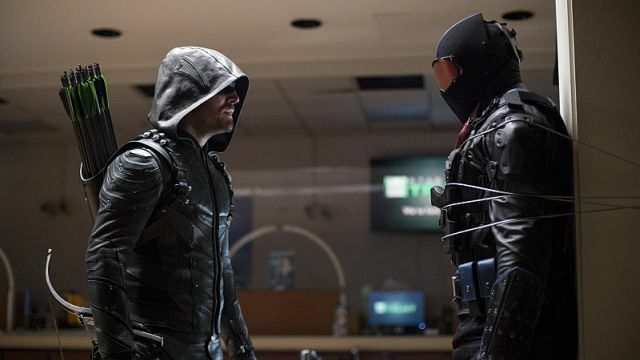 What did you all think of this week's Arrow? Sound off in the comments below! Bratva flashbacks were Kovar tortured Oliver for a week but all he said was Taiana, we find Taiana's mother is working for Kovar hoping he will help her get her kids back (will she ever find out that Oliver killed them both? ), Kovar tells Oliver that he's working with the Bratva and they lied to get him to kill the guy in prison so they could take over his black market business, which is true. Can Oliver ever trust anyone again???? I wish you were right that the mess that is this season is a result of the horrible Baby Mama Drama but I don't see how. This season has been six new characters in the present only one of whom I'm even vaguely interested in, Thea and Lance on a different show, Rene being the one to notice how upset Diggle is about missing JJ's birthday instead of his good friends Oliver, Felicity, Thea, or you know, his wife Lyla, and the marginalization of all the female characters. Only one of the six new characters is female, Felicity has gone from CEO to Uhura switchboard operator. Instead of hacking SCPD she relies on her boyfriend for info and needs Curtis, an engineer, to help her with her algorithms. And don't get me started on Baby Sara being switched for a boy in the only effect of Flashpoint. To fix the Baby Mama Drama of last season, all they would have needed was a conversation between Oliver and Felicity about how he keeps doing the same lies and unilateral moves, a few episodes showing that he's changed, and then back to working together in something like 4A which kept the relationship happy in the background. This dating of other people, which doesn't make sense even to EBR, is just salt in the wounds of 4B. I forgot to add above that Thea has gone from being Speedy and having her own Lazarus Pit/blood lust and dating Alex storylines to basically helping her two men, Oliver and Quentin, do their jobs. She hasn't even got her own storyline this season.